One bhaji I made is the classic Matar-Aloo Sukhe that is eaten with Pooris in Uttar Pradesh. The recipe is simplicity itself with minimum spices and maximum flavour. It can be rustled up in a jiffy. I remember eating this on lazy Sunday afternoons in Delhi with fluffy hot Pooris, Kheera ka Raita, and Anardana Chutney. While it is not even close to possible to recreate those idyllic days, memories seem to force through every so often, and nostalgia takes over. That's when I dash into the kitchen with a craving that needs to be satisfied and get down to reliving the magic!! Heat oil in a pan. Add the cumin, then turn down the heat to medium. Next add the potatoes and stir ensuring that they are well coated with the oil. Stir, then add the peas, red chili powder, salt, and amchur. Mix in, cover and cook for another 8 minutes. Stir in the ghee, check for seasoning, serve hot. Vegan Substitute: Skip the ghee in Step 6 of this recipe. 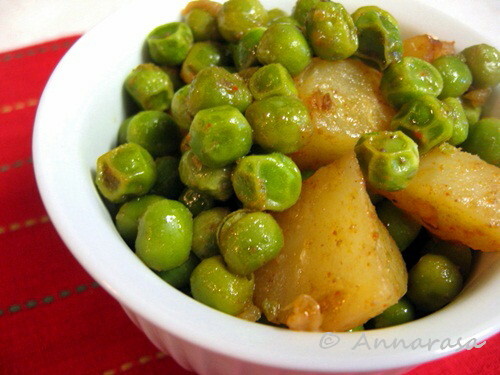 I'll happily have this matar aloo with some rotis rite now, delicious and my fav..
looks so delicious !! and perfect with chapatis !! Looks wonderful. Perfect combo for roti. I would like to invite you to our "Quick and easy recipe mela" and enter your recipe. We would be glad to see your participation. Thanks.